The migration of tropical fish poses a serious threat to the areas they invade, because they overgraze on kelp forests and seagrass meadows. The harmful impact of tropical fish is already evident in southern Japanese waters and the eastern Mediterranean, where there have been dramatic declines in kelps. The authors blame the increased fish on warming oceans due to climate change that have led to hotspots in regions where the currents that transport warm tropical waters towards the poles are strengthening. Increased flow of the East Australian Current, they say, has meant waters south-east of the continent are warming at two to three times the global average. Tropical fish are now common in Sydney Harbour during the summer months. 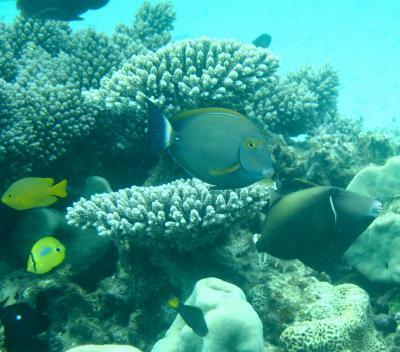 "The tropicalization of temperate marine areas is a new phenomenon of global significance that has arisen because of climate change," says study lead author Dr. Adriana Verges of University of New South Wales Australia. "Increases in the number of plant-eating tropical fish can profoundly alter ecosystems and lead to barren reefs, affecting the biodiversity of these regions, with significant economic and management impacts." Japan, the east coast of the US, northern Brazil and south eastern Africa are also strongly influenced by coastal currents that transport warm tropical waters, they note. Published in Proceedings of the Royal Society B.